Tomorrow morning (US time), the world premiere of Transformers: Age of Extinction will be occuring in Hong Kong. If you are interested in watching, MichaelBay.com has posted the details (below) for a live streaming of the event. 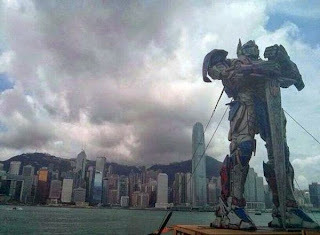 As part of that event, the city has erected a 20 foot tall Optimus Prime statue in Tsim Sha Tsui. Watch all the action from the Transformers 4 Hong Kong Premiere via live streaming event on Thursday June 19th at 9:30AM EST /6:30AM PST. Check here for your local time. Be sure to check out the red carpet arrivals of the film’s many stars and a special live performance by Imagine Dragons performing their hits including ‘Battle Cry”.